The Tiffen 2 x 2" Decamired Blue 3 Cooling Glass Filter - For those who want a sure-fire way of getting accurate color temperature readings, the decamired system is the way to go. Using this formula, you can transpose temperatures from one point to another easily and quickly. This system is also useful when you wish to bring a certain amount of creativity to color photography. Applications include keeping color temperature constant during the course of the day and producing the effect of different times of day. Available in two series, reddish filters that warm the light and bluish filters that cool the light. Each series contains 4 densities: 1.5, 3, 6, and 12. Filters in the same series can be combined. Decamired filters are designed to more easily handle unusual color temperature variations than the previously mentioned filters. Available in increments of both a red and a blue series, Decamired filters can be readily combined to create almost any required correction. In measuring the color temperature of the light source, and comparing it to that for which the film was designed, we can predict the required filtration fairly well. A filter that produces a color temperature change of 100K at 3400K will produce a change of 1000K at 10,000K. This is because the filter relates to a visual scale of color. It will always produce the same visible difference. A color change of 100K at the higher temperature would hardly be noticed. To use this concept, subtract the mired value of the light source from that of the film. 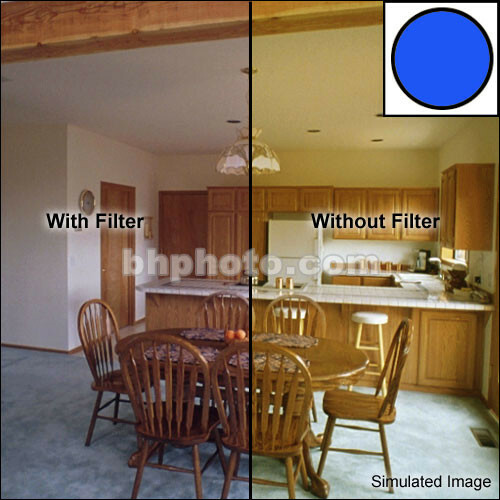 If the answer is positive, you need a reddish filter; if negative, use a bluish filter. Mired-coordinated filters are termed as decamireds. Mired value divided by ten yields decamireds. The 60 mired shifts, above, would be produced by an R6 filter, where the higher values were that of the lighting. Sets of such filters generally come in values of 1.5, 3, 6, and 12 decamireds in both B (bluish) and R (reddish) colors. These numbers are additive; that is, a pair of R3's produces an R6. An R6 plus a B6 cancel each other out to produce a neutral gray.